In earlier days, transportation was not as convenient as how it is now. People in northern part of China didn’t have much choice about vegetables in winter. The most usually seen vegetables are potato, Chinese cabbage and turnip. They can be boiled, stewed, preserved and used to make soup. Pork stew together with these vegetables were very popular and so are they now. This hot dish is ideal for a cold winter. 1. 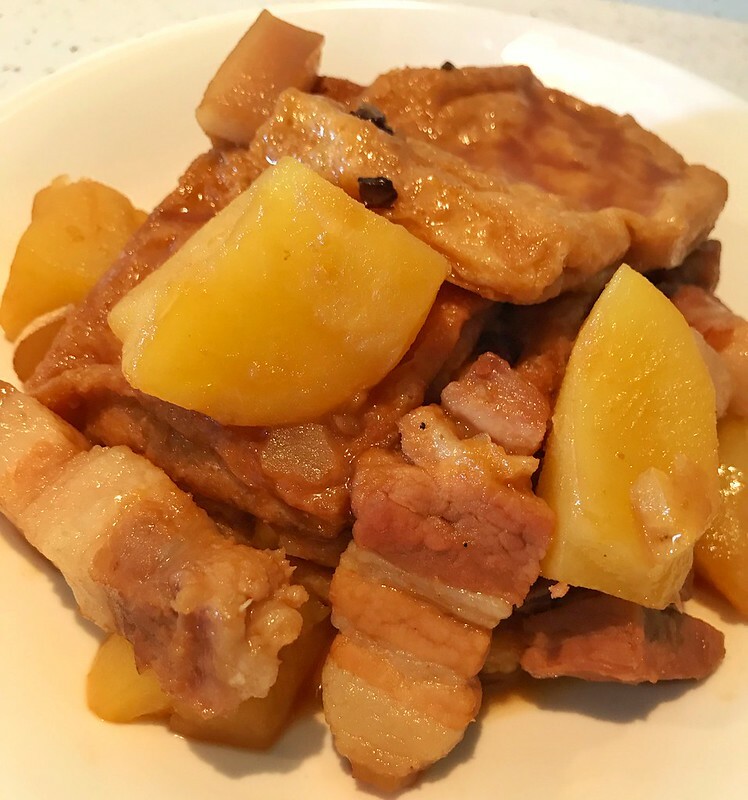 Cut pork belly into smaller chunks. Put them into a pot. Add in enough water. Bring to boil with high heat. Take the pork out and rinse under water. 2. Heat a pan. Add in 2 tablespoon oil and 2 tablespoon sugar. Turn to low heat. Keep stirring to let let sugar melt first and then turn brown. 3. Add in pork. Stir fry and pork will also become brown. Add in spices: ginger, bay leaves, star anise, and dried chili. Stir fry till aromatic. 4. Pour in hot water about 2-3 cm higher than all ingredients. Cove the lid and simmer for 20 mins. 5. For the vegetables, I chose potatoes and puff tofu. Potatoes are peeled and cut into medium pieces. 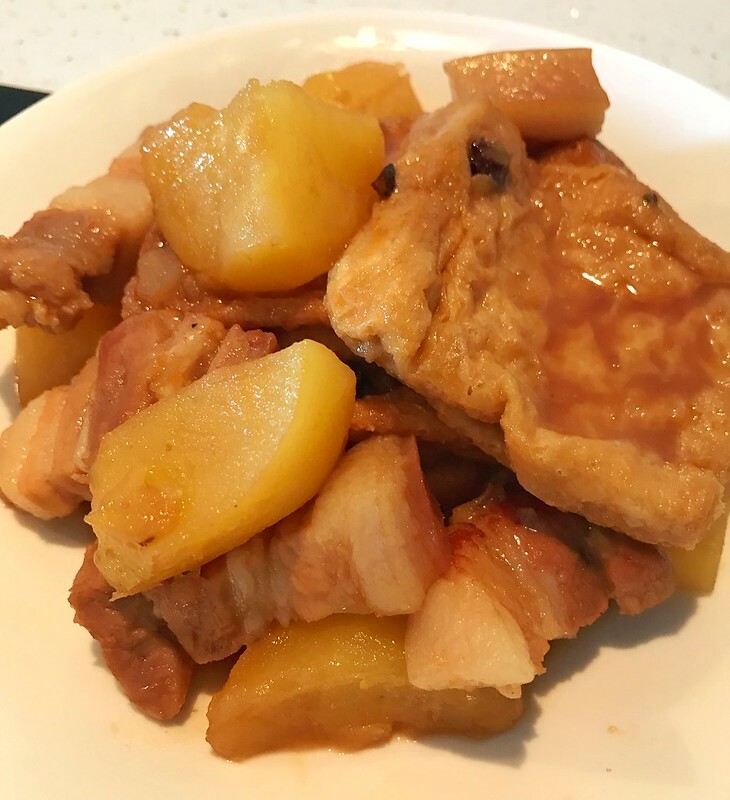 Place potatoes over pork and then tofu puff on the top. Those that hard to be cooked are always at the bottom layer. Cover with lid and simmer for another 25-30 mins. 6. Turn to high heat and reduce the sauce a bit. Then ready to serve.